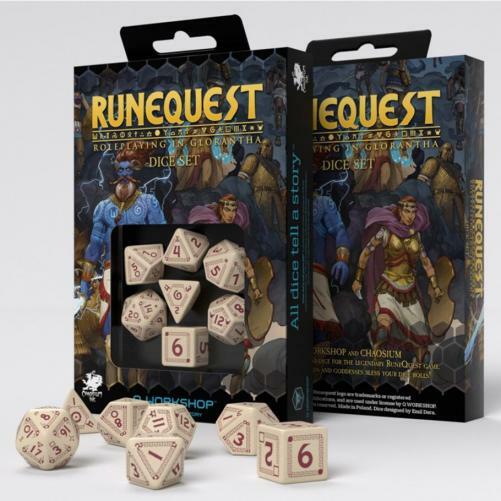 Fill in your details below and we will let you know within 24 hours if we can get 7-set RuneQuest Beige and Burgundy Dice to you with haste! You have found the dice made specifically for the most acclaimed fantasy setting in the history of RPG, one from the many real game’s treasures. The newest edition of the legendary game from Chaosium has come. The world of Glorantha and RuneQuest has forty years of history. It was the second roleplaying game ever! True story! It's a milestone in RPG, so making a set for this game is quite intimidating. RuneQuest and Glorantha are the names with capital „N", full of magic, with great stories and with millions of fans around the world It's a great honor to design dice for one of the fundamental games in the history of our hobby. This is, how Q WORKSHOP can support Myths. These dice are a tribute to this game. The set proudly presented is made from the best material, full of complex engravings that look like Minoan patterns and signed with plenty of runes. These runes represent many powers from Glorantha, and will give your character access to the magic of the Mythic World, and a chance to become one of Rune Masters. Fantasy Bronze Age is waiting!